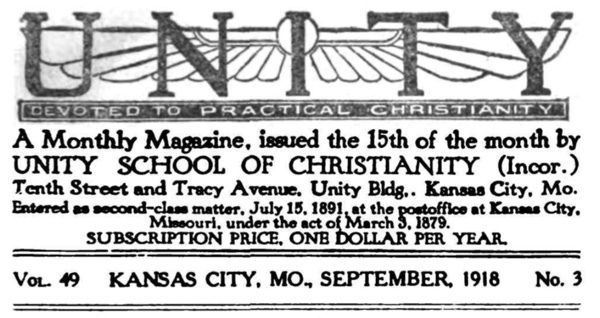 This talk conveys two things: First, that Mind, Idea, and manifestation of Ideas is the foundation of Unity's teaching and, second, that proper manifestation of Ideas requires harmony of thinking, which Charles Fillmore refers to as "being like-minded." To show what he's talking about, he even acknowledges the good in Socialism. Charles Fillmore was no Socialist. And speaking such in 1918 was no way to win popularity in American society. This is a great article and it exemplifies why we should be looking back 100 years in Unity for guidance. ALL PEOPLE who have studied metaphysics, and understand somewhat the action of the mind, recognize that there is one underlying Law, and through that law all things come into expression; also that there is One universal Mind, the Source and sole origin of all real intelligence. First is mind, then that mind expresses itself in ideas, then those ideas make themselves manifest. This is a metaphysical statement of the Divine Trinity—Father, Son, and Holy Spirit. The trinity—Mind, the expression of Mind, and the manifestations of Mind—is found in simple numbers and complex combinations everywhere. The metaphysics of the Hebrew Scriptures are based on this law of the Trinity. They were written far ahead of the race thought and it is probable that those who wrote them did not understand all that was involved in the Word of the Spirit. It is seldom that great writings are fully understood. Less than one hundred years ago, a book aiming to give the names of all the English poets was published in London, and Shakespeare’s name was left out. It is said that a great man must be dead five hundred years before his work will be appreciated. The Hebrew Jehovah has been translated “Lord.” Lord means an external ruler. Bible students say that Jehovah means the self-existent One. Then instead of reading “Lord,” we should read I AM. It makes a great difference whether we think of I Am, self-existence, within, or “Lord,” master, without. All Scripture shows that Jehovah means just what God told Moses it meant—I AM. “This shall be my name to all generations” (Exod. 3:15). So instead of “Lord,” say I AM, whenever you read it, and you will get a clearer understanding and realization of what Jehovah is. Jehovah-jireh means “I Am the provider.” If we expect to demonstrate prosperity from without we find it a slow process; but if we know I AM is the provider, we have the key to the inexhaustible resource. God was also known to the Israelites as Jehovah-shalom—”I Am peace.” It is found we can demonstrate peace of mind by holding the words, “I AM peace,” with the understanding that the real I AM is Jehovah within. But if we start any demonstration and try to apply the I Am to personality, we fall short. This is frequently the cause of lack of results in carrying out the laws that all metaphysicians recognize as fundamentally true. The mind does not always comprehend I AM in its highest, neither does it discern that the All-Knowing, Omnipotent One is within man. This recognition must be cultivated, and every one should become conscious of I AM presence. This consciousness will come through prayer and meditation upon Truth. In Truth there is but one I Am—Jehovah, the Omnipotent I Am. If you take Jehovah-shalom into mind and hold it with the thought of a mighty peace, you will feel a consciousness, a harmonizing stillness, that no man can understand. It must be felt, realized, and acknowledged by your I Am, before the Supreme I AM can pour out its power. Then you will know you have touched something; but you cannot explain to another just what it is, because you have gone beyond the realm of words and made union with the Cause side of existence. It is the quickening of your divinity through the power of the Word. This Divine nature is in us all, waiting to be brought into expression through our recognition of the power and might of I AM. We should not fail to always think of the spiritual law under which I Am moves. It is possible for man to take I Am power and apply it in external ways and leave out the true spiritual law. In our day we are proclaiming that man can use I Am power to restore health, bring financial prosperity and increase happiness, in fact, that he can, through righteous, lawful use have everything that be desires. But some people are using this power in a material way, neglecting soul culture, building up the external without taking the intermediate step between the Supreme Mind and its manifestation in the outer. We should remember that the soul must grow as well as the body. I know a man who was overtaken with physical disability and loss of eyesight some seven years ago. In his extremity he turned to the spiritual law for help. I saw him not long since, and his physical condition was unchanged. But there was a great change in his soul He had found the light and he was filled with inward rejoicing. He had become blind that be might see. But his family thought all his dependence upon Truth had been a failure. During all these seven years he has managed his business and it has prospered, and his family has been well provided for. He was for a time disappointed and rebellious because his eyes were not healed; but now he is glad, because through the prayer and thought he was forced to adopt be has found the inner light. So if you find yourself disappointed because you do not at once demonstrate health or success, be at peace and know that your earnest prayers and meditations are working out in you a soul growth that shall yet manifest beyond your greatest hopes. Remember that if the powers of man are expressed they must also be manifested; but do not expect any real manifestation without expression. It is easier to seek the Truth willingly and be watchful and obedient than it is to be forced by some severe experience. Hard experiences are not necessary if we are obedient to the Truth that saves us from them. Every day time should be given to prayer and meditation. The soul cannot grow without them, and no man who neglects them will develop his spiritual powers. The Great I Am is not far away from man and the earth. Spirit is closely connected with the little things of daily life. “The kingdom of God is come nigh unto you.” This means that the mighty One is with us in all ways. We are all in touch, heart with heart; and a real sympathy makes us one. In reality we all love the simple life. The pomp and parade and pageantry of the external world do not satisfy the soul. It is the small things that touch the heart and appeal to us. We want realities. Even on the stage we demand the realistic I once read of a playwright who tried to give all of his scenes the touch of realism, and in one place he had electric fans so placed that they would blow to the audience the odors of the viands that the actors were eating, thus convincing the people that fhe food was real. While one of his plays was being given, a cat strayed in, came on the stage, stretched before the fire place, lay down and went to sleep. The audience applauded. This added a touch of naturalness that the playwright was anxious to introduce as a permanent feature of the play. But it is hard to get a cat to do things when you want it to do them. However the playwright set himself to study out how he could induce the cat to go through with its part, and he hit upon this plan: About noon each day he shut the cat up in a very small box, so that it had no room to stretch, then let it out just at the time its appearance on the stage was desired. Of course the first thing it did was to stretch, then drink from a saucer of milk set ready for it; then it would lie down before the fireplace and go to sleep. So he solved the problem, and this little touch of commonplace realism became the hit of the play. It is on such little things as these that success hinges in the play called “life.” I Am Might is not in the storm, nor the earthquake, nor the fire, but in the “still small voice,” according to Elijah the Tishbite. Peter’s admonition, “Be ye all like-minded,” is one in which we can join with a larger understanding probably than the early Christians to whom he was writing, because we have a better understanding of the mind and the laws governing its action. We are receiving new phases of truth along all lines, and to us it seems most important that our religion be progressive; that we get new and higher concepts, and see deeper and more scientific relations in the lessons and experiences of those who have preceded us in study and demonstration of spiritual truth. If there is science in God’s universe there must be science in the Mind that projected that universe. If there is mathematical accuracy in the order of the material world, there is a like accuracy and order in the mental world. If there is science in the relation of atom to atom, if there is science in the current that flows over the wire and sets in motion the electric fan, there must be science in the Mind back of all these manifestations. God created all things from his mind, by his thought, through the power of his Word. The Divine fiat went forth “Let there be,” and “it was.” The one Mind is still projecting itself into the universe, and its law is expressed through thought rightly directed. The highest expression of Divine thought is man. How important, then, that man should study the science of mind, and in every way seek to find the law lying back of the harmonious universe. You will find people like that everywhere. They think this is some new religion, and when they come to understand that it is absolute science they are willing to look into it. Before you can realize the great, mighty power of ideas, you must unify them. All must pull together. Get your ideas in divine order, and a mighty mind force will begin to work for you right away. This divine order is necessary to the upbuilding of both mind and body. This divine order is the “kingdom of heaven” so often referred to by Jesus. To attain this unity and harmony of mind it is necessary to have perfect statements of Truth, and adhere to them in thought and word. States of mind can be set into activity just as, through the manipulation of gasses, electricity, etc., we may purify and impart certain potencies to the atmosphere. In a far larger degree ideas change the atmosphere of the race. Jesus Christ had a grasp on Divine Ideas, and if I believe in and follow him I shall come into that same state of mind. We become like-minded by entering into the absolute. In the one Infinite Mind there is only harmony. In that Mind is the Idea Love; and you can see that as we all think thoughts of love it will do away with all discord, all separation, all caste; selfishness will be eliminated, and the whole human family will be joined in the one Divine Love. Last week a man came saying he was in harmony with and wished to join Unity; but he also wanted to join a socialist society. He had been reading on socialism and thought our work and theirs were along similar lines, and he asked if there would be any conflict if he joined both societies. Now, we believe in the broadest, most generous thought. Search where you will, read what you want to read, think for yourself, be free; at the same time keep your eye on the highest you can conceive, and avoid all lines of thought that are contentious and argumentative. Socialism has a truth back of it. The early disciples had all things in common, and the Truth as exemplified in the universe shows that everything really belongs to the whole creation. We may think as we look at the ocean that it is separate from the rivers and the moisture in the clouds. But the moisture in the clouds will be precipitated and find its way into the ocean. The same unity of life is seen everywhere, and when we take hold of and adjust ourselves to a right understanding of life all things adjust themselves to us. We are all sharers in all things, and if we go about it in the right way, the great Law will bring to us our very own. But to succeed we must adopt the law of love and justice. If we see contentions and take a fighting attitude toward those who seem to have more than we, we violate the law and cut off our supply. All the money in the world might be equally distributed, but if selfishness and ignorance of truth continued to rule, it would not be long until some men would again have more than others. If those who now have but little could exchange places with the men of wealth, they in turn would become oppressors. The same mental states will always produce the same conditions. Therefore we must look deeper and lay hold of the Law of Love and unify ourselves with it. A rich man will give his money to you as freely as to his family, if you find the way to his heart. Love is the great unifier, and when the whole human family are united in love, no one will lack; and there will be no soldiers nor warships, no strife, no contention. Every knee must bow to the Prince of Peace. Jesus Christ must be held up as a standard, and all our ideas must be unified with his ideas. Do not allow any opposing, clashing thought toward anybody or anything to work in you. If you do it will separate you from friends and finances. As you unify your own mind forces in the one Mind, the body will be lifted up into a new state of harmony. If anyone is not demonstrating the principle, it is because he is not unified with the one great Harmony. He is not expressing the Divine Mind as he should, because he is not realizing his oneness with it. Resolve to become one with God through Christ. Harmonize yourself with him, and all your world will be in harmony. Be on the alert to see harmony everywhere. Do not magnify seeming differences. Do not keep up any petty divisions, but continually declare the one universal Harmony. The Christ Mind is here as the unifying Principle of this race, and we must believe in the Divine Man working in us and through us, and know that through it we are joined to the Father Mind. That is the Father’s house to which we have all so long been seeking to return. In the consciousness of the Father Mind the unity of God and man is demonstrated. “I in them, and thou in me, that they may be perfected into one” (John 17:23).